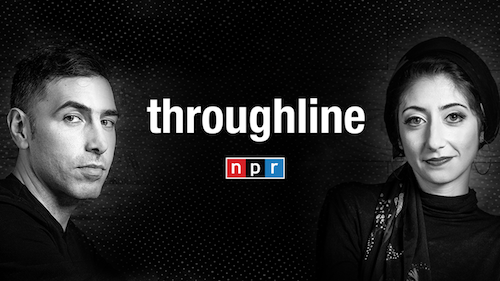 Throughline, the newest addition to NPR’s podcast roster, provides the history we sometimes forget — or didn’t know in the first place — of events in the news and ideas dominating our national conversations. Through cinematic and sound-rich storytelling, hosts Rund Abdelfatah and Ramtin Arablouei will give you the story and perspectives often missing from history textbooks to help you understand our world today. Beginning February 7, Throughline will explain how the U.S. overthrew Iran’s democratic government and changed the world; unpack how conspiracy theories shaped American political culture; explore the tradition of black athletes using their platform to protest injustice, and more. 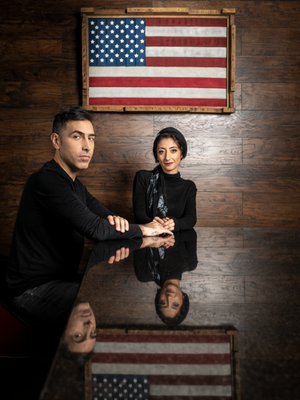 Ramtin Arablouei and Rund Abdelfatah, co-hosts of Throughline, in the Salon Doré at The Corcoran School of the Arts and Design at the George Washington University. A trailer is available now on Apple Podcasts, NPR One, Pocket Casts, and wherever podcasts are available. Versions of Throughline episodes will also air on Morning Edition. “To understand today’s conversations about major issues and events, we need to know the complete history of things like immigration, US-Iran relations, and the opioid epidemic,” said co-host Ramtin Arablouei. Ramtin Arablouei and Rund Abdelfatah in the Spark at Engine 12. Rund Abdelfatah has worked at NPR since 2014. She’s helped launch and produce How I Built This, Pop Culture Happy Hour, Code Switch, the NPR Politics Podcast, and TED Radio Hour, among other projects. She got her start in journalism covering local and domestic politics at the Washington Bureau of the BBC. Before starting as the first producer on NPR’s How I Built This in 2015, Ramtin Arablouei was a freelance composer, working on movies, commercials, and podcasts. He’s composed music for eight podcasts that have been in Apple Podcasts’ Top 10: TED Radio Hour, How I Built This, Hidden Brain, Invisibilia, Embedded, The Indicator from Planet Money, Reveal, and Wild Thing.